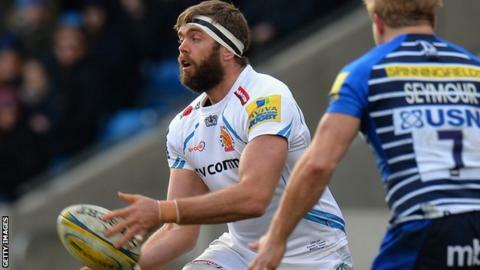 Exeter Chiefs head coach Rob Baxter has praised England lock Geoff Parling for playing through illness in their 26-17 Premiership victory against Bath. He shrugged off a cold to play the entire match as Exeter closed to within three points of leaders Saracens. Baxter had already been forced into one second-row change, with Ollie Atkins stepping in for the injured Jonny Hill. "He (Parling) understood our resources were pretty stretched and fair play to him," Baxter told BBC Radio Devon. "Geoff was actually really quite ill but came in and was aware we already had one change in the second row. "The way the game was going from lineout to lineout it was important to maintain that stream of lineout possession. I thought Geoff did extremely well there for us." Baxter was also delighted with the performance of prop Harry Williams, who made his first top-flight start for the club. "I thought Harry did really well and to be fair I think the other five lads behind the front row backed them up exceptionally well," added Baxter.